If you google “how to reduce bounce rate”, you’ll get a ton of useful resources which describe how you should improve your content, add more call-to-action, etc. And I totally agree with them. Content IS the king. The more I publish posts on this blog, the more I realize it’s true. But this blog post is not about the content, readability, or user experience. 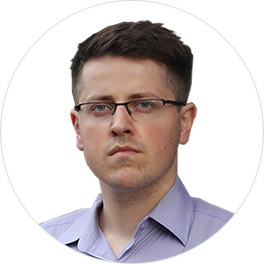 Today, I’ll rant a bit more about the technical side of bounce rate. In fact, your content may actually be fine, while your tracking isn’t. 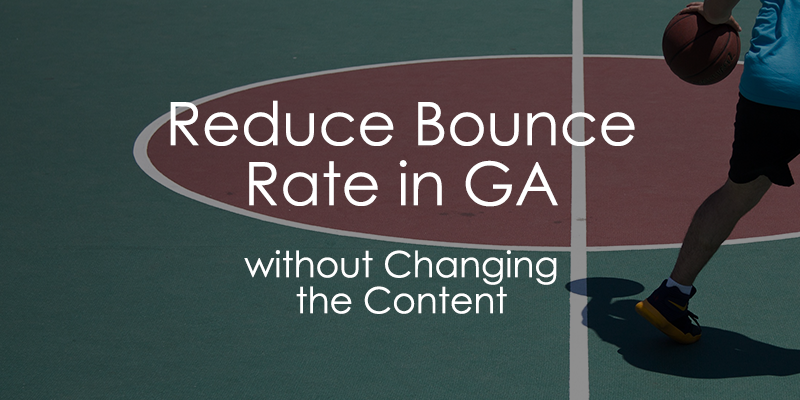 I will share my tips on how to reduce the bounce rate in Google Analytics (but not too much). In my opinion, the most precise definition would sound like this: Bounce Rate is the percentage of single-interaction sessions on your web page. In other words, a visitor landed on your site, did nothing (i.e. did not interact with the content), and then left. I will not get into more details about the definition of bounce rate, because that could be another 5000+ words blog post. But you get the idea, right? 1 interaction (page view) = bounce. 2+ interactions = no bounce. How is a bounce rate calculated in Google Analytics? Let’s get back to theory for a moment. Google Analytics calculates and reports the bounce rate of a web page (1) and bounce rate of a website (2). If a visitor lands on a page, that counts as a page view. If he/she navigates to another page of your website, another page view occurs (which is counted as interaction). Great! Your website’s bounce rate has decreased a bit because there were two interactions. Let’s imagine another scenario. Your website consists of very long (5000+ words) blog posts. They are super useful and visitors adore them. But once they read it, they close the browser or switch to another tab. Why? It was a bit exhausting for them to invest their time and effort to read the entire blog post. Now, they have to do something else (take a break, go drink a coffee, or finish some task, or whatever). By default, this kind of session would be counted as bounce in Google Analytics. 1 page view –> Exit. But in reality, that visitor thoroughly read your blog post, clicked few images to zoom, etc. Actually, there were interactions, you just didn’t track them. Interactions affect bounce rate. And page view is NOT the only possible interaction. Thanks to Google Tag Manager, you can now easily track additional interactions which can affect bounce rate (if you want it, of course). 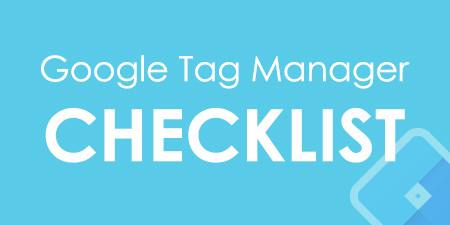 Here’s a quick context for those wanderers who accidentally found this blog post and have not clue what Google Tag Manager (GTM) is. GTM is like a middle-man between your website and various tracking tools (like Google Analytics). It enables you to track various interactions and send data to GA or any other tool. 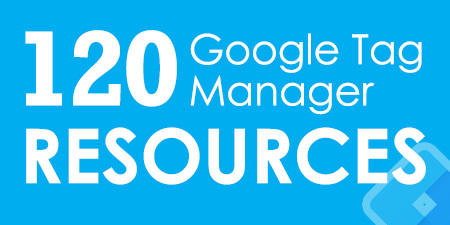 If you want to learn more, download my Ultimate List of 120+ GTM Resources or read the differences between Google Analytics and Google Tag Manager. OK, let’s learn how to reduce bounce rate with help of GTM. First, you need to decide which interaction(s) on your website are important and should be tracked. 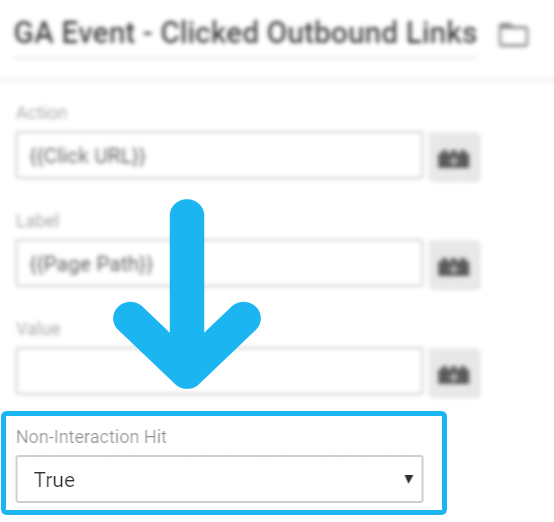 Then you should configure tags, variables and triggers in GTM to push these interactions as events to Google Analytics. Every event is sent as non-interaction hit: false, which means that they will reduce bounce rate. Clicked LIKE button in your blog post. Played a video embedded on the site. Submitted a form (which does not reload the page), etc. If you run a blog which has default buttons of social networks installed (Facebook, Twitter, Linked in, or Pinterest), consider tracking their clicks. Track Facebook LIKE button clicks. You can also read this guide for detailed explanation. Track Twitter TWEET button clicks (also, retweet, etc.). You can also read this guide for more information. Track Pinterest PIN button clicks. Track Linked In SHARE button clicks. All these recipes will listen to clicks of social buttons and fire Google Analytics social interaction events, if one occurs. Keep in mind, that these GTM recipes will track only standard buttons (which are created by developers of those social networks). If you’re using some 3rd party social sharing plugins (like AddThis or Sumo), you’ll need to track them by using All clicks trigger in GTM (or find other solution). Track Youtube player interactions. If this recipe did not work, try version 2 and version 3 of GTM recipes. All these recipes track the following interactions: play, pause, viewed a particular percentage of the video (e.g. 25%). Each interaction will be sent to Google Analytics as an event which lowers your bounce rate. These recipes track the following interactions: play, pause, viewed a particular percentage of the video (e.g. 25%), etc. Each interaction will be sent to Google Analytics as an event which will reduce bounce rate. While some of you might disagree with me, I count outbound link clicks as interactions. When a visitor reads your content and clicks a link which redirects them to another website, that’s an outbound link click. Although this interaction is negative for your site (because that visitor might not come back after the click), it’s still an interaction. A visitor willingly read some portion of your content and then clicked a link. Here’s a Google Tag Manager recipe which tracks outbound link clicks and fires events to Google Analytics (which lower bounce rate). If you have ever tried tracking forms with Google Tag Manager and Google Analytics, you already know that there is a bunch of different form types with their own nuances. Some of them refresh the page or redirect you to a Thank you page after successful submission. In this case, you’re not obliged to do any additional tracking, because your bounce rate is already reduced by refreshed page (or redirection). But there’s a huge chance that your website contains AJAX forms. In my comprehensive guide 5 Form Tracking methods with Google Tag Manager, I have explained how you can easily track AJAX forms and send events to Google Analytics (thus reduce your bounce rate). So make sure you try it out. Track Custom events. If your website contains lots of custom functionality, ask developers to fire dataLayer events when they occur. Then, with help of Google Tag Manager, you’ll be able to track those events and push data to Google Analytics. These events will also lower your bounce rate. I have published a guide about Data Layer and how you can track custom events with GTM. 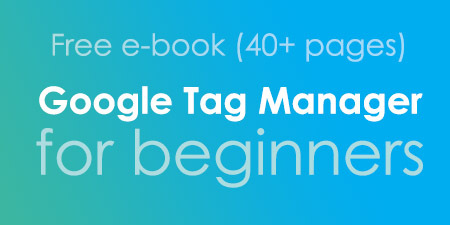 If you’re looking for more Google Tag Manager recipes which can help you reduce bounce rate, check out my library of 30+ GTM recipes. These little packs of code will save you lots of time. By the way, reduced bounce rate isn’t the only positive outcome of event tracking with Google Tag Manager and Google Analytics. 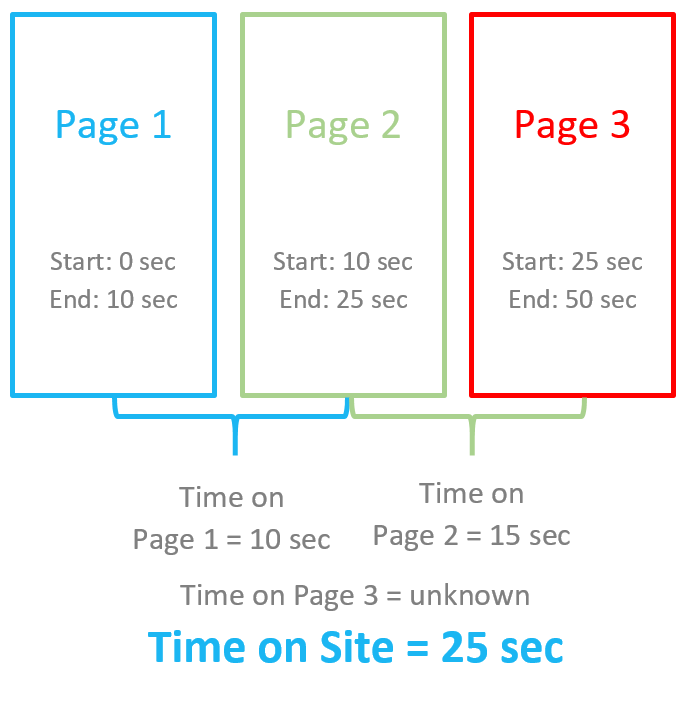 It also affects how time on page metrics are calculated. Justin Cutroni has published a great post explaining how Google Analytics time calculations are made. If there are multiple page views during a visit then the time calculation is based on the start time between the current page and the start time of the next page hit. Here’s a visual representation. We can’t calculate the time on the last page of the visit because there is no page view after the last page. If a visit only contains one page view (i.e. the visit is a bounce) then Google Analytics can track time on page by using other engagement hits. All events that were mentioned in my blog post are treated as engagement hits. 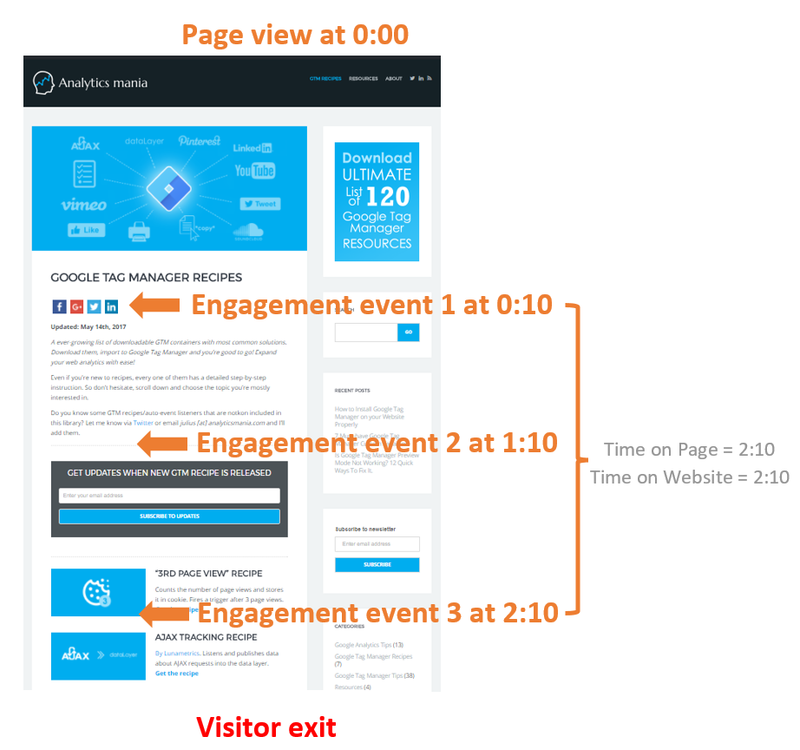 If you add multiple engagement hits to a page you can get a more accurate measure of time on page and site, as shown in the image below. Google Analytics uses the last “engagement hit” to measure time on a page when there is only one page view during a visit. So with more events, you’ll not only reduce your bounce rate but also make Time on Page and Time on site metrics more accurate. Before you go on a rampage with tracking various events on a website, hold on and think everything through. First, you need to write down a list of really important events that you consider as interactions. Now, read the list once again and get rid of few least important items. Read every list item carefully and ask yourself: Is this really important event? How will I use it in my analytics and marketing? What value can it bring to me? If you could remove a few items easily, they were not that important, after all. If you find it hard to remove any of your events, keep them. The biggest mistake that I see when people try to reduce bounce rate with events, is that they track everything as interaction (engagement) hits. For example, they consider scrolling events as interactions as well, although they shouldn’t. If a user opens your website, scrolls a bit and then leaves after 3 seconds, that should not be counted as a session with engagement. This is definitely a bounce. So please, push only important events as interaction hits to Google Analytics. If you still want to send some events (but don’t want to affect bounce rate), set them as non-interaction hit:true in Google Tag Manager. These events will be still available in Google Analytics events reports, but won’t distort bounce and time metrics. If you want to reducethe bounce rate in your Google Analytics reports, you should fix two things: content and tracking implementation. This blog post focused on the latter issue. While fixing content (and website itself) is super important (it should be engaging, informative, easy to read, etc. ), web tracking should not be forgotten, as well. Bounce rate is the percentage of single-interaction sessions on your web page. Interactions affect bounce rate. And page view is NOT the only possible interaction. Thanks to Google Tag Manager, we can easily track more important events that occur on our websites, thus reduce bounce rate. In this blog post, I have shared a lot of ready-made Google Tag Manager container templates (a.k.a. recipes) for event tracking. They listen for particular interactions on a page and send events to Google Analytics. Just download them and follow the instructions. Within minutes, you’ll start tracking important events, reduce bounce rate and increase the accuracy of time metrics in your Google Analytics account. I personally find that tracking time on page works even better to reduce bounce rate. I consider that someone spending at least 30 sec on a page is interested in your content. 80% of my visitors spends at least 1 min on my website and I still get a 72% bounce because they just go to some specific pages on my blog and then bounce. That's why I have decided to create an event based on time spent on a page :) My bounce rate is now about 20%.